What value would your new deck surface be if it did not come with a written warranty? We believe customers should have the opportunity to review the details regarding vinyl deck warranties before they make a decision to purchase Tufdek waterproof decking products. 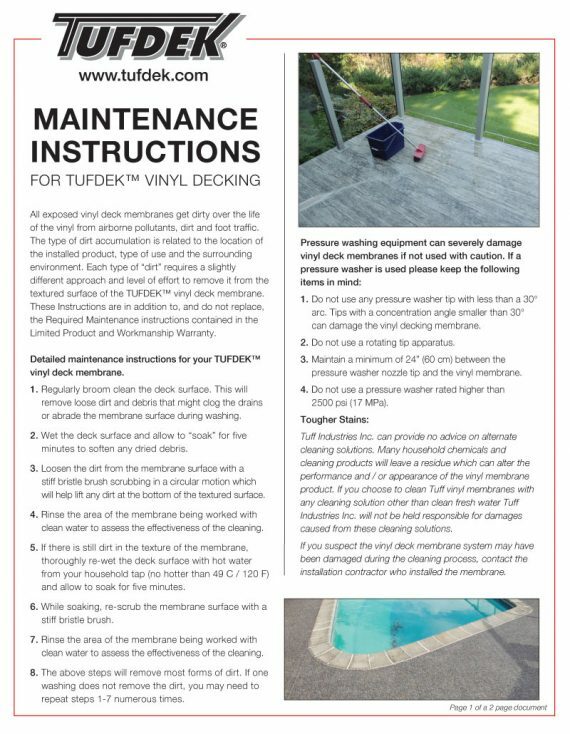 Tufdek Authorized Dealers will supply a written Tuff Industries waterproofing product and Authorized Dealer labor warranty upon completion of the installation of your new vinyl decking surface. Tuff Industries covers the waterproofing product warranty while the Authorized Dealer covers the workmanship warranty for the labor related to the installation of your new deck surface. 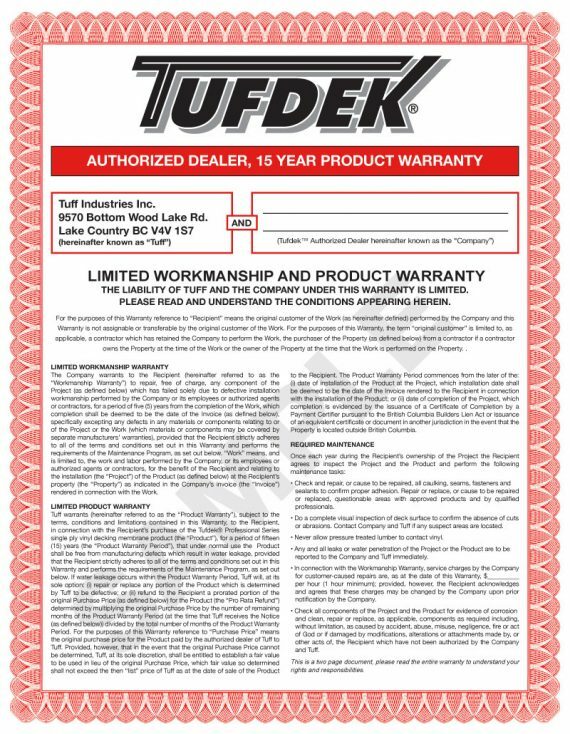 This warranty should provide confidence when it comes to waterproof protection, no one provides a more comprehensive product and labor warranty than an Authorized Tufdek Dealer! Each dealer and installation contractor is independently owned and operated. Each dealer is an authorized licensed user of the trade mark Tufdek™, which trade mark is owned by Tuff industries Inc. Dealers and installation contractors have no authority to assume or create any obligation whatsoever, expressed or implied, in the name of Tuff Industries Inc., nor to bind Tuff Industries Inc. in any manner whatsoever. Dealers and installation contractors are solely liable for all installation-related repairs and defects and related warranty work. Tuff industries Inc. strongly recommends that customers first conduct their own independent due diligence and investigations regarding the experience and qualifications of such dealers and installation contractors prior to retaining them.